The oldest and most universally known labyrinth existed over 3,500 years ago on the Greek island of Crete--home of the mythical Minotaur. Now, over three millennia later, walking the labyrinth has become an astonishingly popular form of spiritual and emotional growth and healing. In fact, walking the labyrinth has proven itself to be so transformative and soothing, labyrinths are now being built on school playgrounds, university campuses, hospital courtyards, and even prison grounds. Why the sudden surge in popularity? 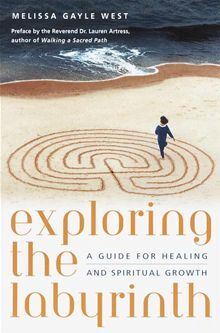 "Walking the labyrinth fulfills six important contemporary needs," according to author and psychotherapist Melissa Gayle West: "deepening spirituality; inwardness and connection; access to intuition and creativity; simplicity; integration of body and spirit; and intimacy and community." These are tall orders, but West manages to demystify this powerful process, explaining how it differs from walking a maze and how readers can make their own labyrinths. The book's narrative and organization themselves flow as thoughtfully and compellingly as a labyrinth. The three main sections cover "Meeting the Labyrinth," "Making the Labyrinth," and "Playing and Healing with the Labyrinth." West also offers an extensive resource listing and a thorough index. This is easily one of the best contemporary guidebooks on this fascinating and evolving form of spiritual practice.